Which one is it if it walks like a bear, looks like a cat with an aardvark’s snout and a raccoon’s tail, and grunts like a pig? If the encounter takes place anywhere between the southwestern United States of America and Colombia, then the animal is not a hallucination or a hybrid. It is the white-nosed coati, one of the raccoon family Procynidae’s cat-like members. Coatí norteño, cholugo, gatosolo, moncún, pizote and tejón in Spanish. South American coatis, Nasua nasua. Western mountain coatis -- Nasuella olivacea -- in Colombia and Ecuador. Recategorization ultimately responds to genetic analyses, whose data-gathering is hindered by difficult access to dwindling populations. But genetic studies identify olingos (Bassaricyon) as closer relatives. Both genera partially overlap geographically since olingos inhabit Central and South American rainforests, from Nicaragua into Peru. 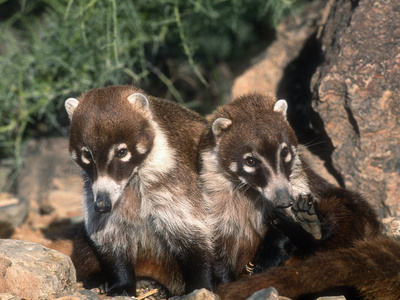 Scientists speculate that the two genera overlap genetically in a common ancestor differentiating into coati and olingo lines of descent about 10,200,000 years ago. Mature white-nosed coati head-and-body and tail lengths each attain 20-25 inches (51-63 centimeters). Mature shoulder heights average 12 inches (30 centimeters). Mature body weights hover around 5.5-27 pounds (2.5-12.2 kilograms). Lower ranges represent adult female dimensions. Adult males tend to be twice as heavy, long, tall and wide as females. Near each corner of the mouth. Rounded ears top an aardvark- and fox-like slender head. The white-nosed coati’s tail and upper-sides are grizzled brown. The under-sides look beige or buff. The tail showcases indistinct, raccoon-like, unbroken rings. It tends to be held upright when white-nosed coatis are ambulatory or paused and straight -- with a cat-like swishing tip -- when they are contemplative or content. It will curl around stumps and branches as the white-nosed coati descends super-steep slopes and trees. Each dark, bear- and raccoon-like paw has a non-retractable claw on each of five toes. Each ankle rotates 180°+ to facilitate head-first, squirrel-like descents. Coatis walk human-like, on the soles of their paws. South America’s tropical mountainsides and rainforests. Vertebrates such as birds, lizards, and mice. They generally will bare teeth, grunt, lower heads and pounce upon mealtime intruders. They will fight most valiantly when white-faced capuchin monkeys attempt to abduct or kill coati pups. They will practice accommodation -- when residential developments proliferate -- or retreat to loftier, remoter, steeper locations when agro-industrialists clear-cut landscapes and hunters seek a white-nosed coati’s scrumptious flesh and warm fur. In all of the above-mentioned scenarios, coatis consider the repulsion factor. They never forget their neck- and belly-located scent glands. They always have the option of readjusting their ever-present, ever-so-slightly musky body odor to gagging levels or of releasing volleys into predatory eyes and mouth. white-nosed coati "on the fence": friendly and/or inquisitive? 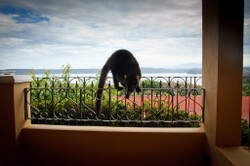 Encounters with white-nosed coatis are unforgettable. In-the-wild occurrences involve one of two memorable extremes: large-group or one-on-one interactions. Groups tend to contain 4-25 females and juveniles. Members travel in close or loose proximity. Regardless of the outing’s purpose, all members utter loud noises almost continuously. A solitary white-nosed coati often can be assumed to be male. Upon reaching sexual maturity at age two, a female coati usually forms or joins bands with other females. At the beginning of the rainy season -- January at higher altitudes, October in lower elevations -- the group invites solitary males -- whose sexual maturity is reached at age three -- to join for mating purposes. Females oust all adult males from the group at the end of the mating and rainy seasons -- March higher up, February lower down. Mothers-to-be temporarily abjure membership in the band. They build nests among rocks or in trees. They deliver 3 to 7 kits 11 to 12 weeks later. They join their original group when the kits are six weeks old. All skill-acquisition passes from the mother to the kit, the pup and the juvenile. Adult females can be cautious of human interactions. They communicate that wariness to their young. But at the same time, a white-nosed coati of any age is super-intelligent and ultra-observant. Many a North American near deserts and Central or South American near jungles know from personal experience of the tamability and trainability of white-nosed coatis. 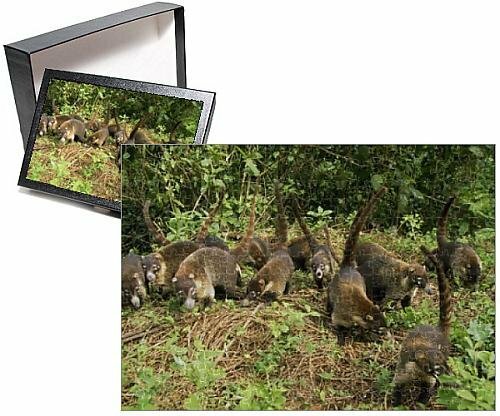 Coatis and their relatives -- cacomistles, common and crab-eating raccoons, kinkajous, ringtails -- are popular pets from southern North America through Central and South America. Captivity doubles white-nosed coati lifespans, from 7-8 years to 15-20. It is acceptable to females and juveniles. Walk on tightropes or with leashes. Monthly treats of beef, crickets, eggs, mealworms, poultry, and taurine-rich crustaceans and mollusks to replenish animal tissue-specific organic acids. Clean surroundings, fresh food, and regular exercise will make the difference between happy and unhappy white-nosed coatis and their caregivers. Cautious domestication of exotic pets sometimes advances understanding Earth’s wilder moments. It sometimes leads to environmental awareness and sustainability. Nature preserves, protective legislation, and responsible development make the world safe for white-nosed coatis and coati-lovers. "An Age Entry for Nasua narica." The Human Aging Genomic Resources: online databases and tools for biogerontologists. genomics.senescence.info. Retrieved December 20, 2013. Bateman T.. (2008). The Frog with the Big Mouth. Albert Whitman & Co.
Brehm, Alfred Edmund. (1900). Brehms Tierleben; allgemeine kunde des thierreichs. Mit 1910 abbildungen im text, 11 karten und 180 tafeln in farbendruck und holzschnitt. Volume 2: Säugetiere. Leipzig and Wien (Vienna): Bibliographisches Institute. Burn B. (1984). North American Mammals. Bonanza Books: The National Audubon Society Collection Nature Series. Burt W.H. (1980). A Field Guide to the Mammals. 3rd edition. Houghton Mifflin Co: Peterson Field Guide Series. "Coati." en.wikipedia.org. Retrieved December 20, 2013. "Coati (Nasua narica)." Pima Community College: Desert Ecology of Tucson A2. Retrieved December 20, 2013. Decker D.M. (1991). "Systematics of The Coatis, Genus Nasua (Mammalia, Procyonidae)." Proceedings of The Biological Society of Washington 104:370-386. Retrieved December 20, 2013. Eisenberg, J.F. and K.H. Redford. (1999). Mammals of the Neotropics. Volume 3: The Central Neotropics. University of Chicago Press. Perry S. and L. Rose. (1994). “Begging and Transfer of Coati Meat by White-faced Capuchin Monkeys, Cebus capucinus. Primates 35(4):409-415. Retrieved December 20, 2013. "First Ever Mountain Coati in Captivity in Colombia." Wildlife Extra News, September 2010. Retrieved December 20, 2013. Gomper M.E. (23 June 1995). "Nasua narica." Mammalian Species 487:1-10. Retrieved December 20, 2013. Grant S. (2006). "Coatimundi (coati) (Nasua sp.)." Exotic DVM 8(6):22. Retrieved December 20, 2013. Guzman-Lenis A.R. (2004). "Revisión Preliminar de la Familia Procyonidae en Colombia: Preliminary Review of the Procyonidae in Colombia." Acta Biológica Colombiana 9(1):69-76. Retrieved December 20, 2013. Hamilton V. (1995). Jaguarundi. Blue Sky Press. Helgen K.M., R. Kays, L.E. Helgen, M.T.N. Tsuchiya-Jerep, C.M. Pinto, K.P. Koepfli, E. Eizirik, J.E. Maldonado. (2009). "Taxonomic boundaries and geographic distributions revealed by an integrative systematic overview of the mountain coatis, Nasuella (Carnivora: Procyonidae)." Small Carnivore Conservation 41:65-74. Retrieved December 20, 2013. Landau E. (1996). Tropical Forest Mammals.Children's Press. Layne J.M. (1997). "Nonindigenous Mammals." In: Strangers in Paradise: Impact and Management of Nonindigenous Species in Florida Edited by D. Simberloff, D.C. Schmitz and T.C. Brown. Island Press, pp. 170-171. Lydekker, Richard, ed. (1894). The Royal Natural History. Illustrated with Seventy-two Coloured Plates and Sixteen Hundred Engravings. Vol. II Section III. London and New York: Frederick Warne & Co. Retrieved December 20, 2013. Marceau J. (2001). Nasua narica white-nosed coati. In: Animal Diversity Web. University of Michigan Press. Retrieved December 20, 2013. Murie O.J. (1982). Animal Tracks. Houghton Mifflin Co: Peterson Field Guide Series. "Nasua narica." Integrated Taxonomic Information System Collection of Life. Retrieved December 20, 2013. "Nasua narica." Integrated Taxonomic Information System Report. Retrieved December 20, 2013. "Nasua narica white-nosed coati." Encyclopedia of Life. Retrieved December 20, 2013. "North American Mammals: Nasua narica White-nosed coati." Smithsonian National Museum of Natural History. Retrieved December 20, 2013. Perkins M. (2006). "Mammals of North America: Land of the Coati-Mundi." Mutual of Omaha's Wild Kingdom: The Definitive 50-Episode Collection. Brentwood Home Video: Disc 4 Side B. "Procyonids: Raccoons, Ringtails & Coatis." Arizona-Sonora Desert Museum. Retrieved December 20, 2013. Quiroga, Horacio. (2003). 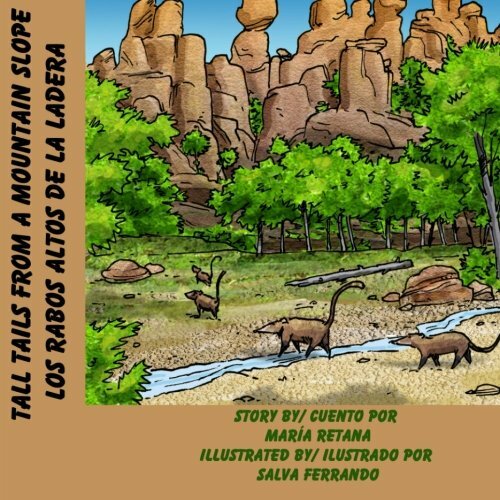 Cuentos de la Selva. Reysa Ediciones. Reid F.A. (2009). A Field Guide to the Mammals of Central America and Southeast Mexico. Oxford University Press. Schindler, S.D. (2013). Spike and Ike Take a Hike. Nancy Paulsen Books. Schmidly D.J. and W.B. Davis. (2004). The Mammals of Texas. University of Texas Press. Sullivan, Pat Harvey. (2002). Raccoons and Their Relatives. World Book. "Tábąąh mąʼii bíchį́į́h nineezí." nv.wikipedia.org. Retrieved December 20, 2013. Taylor D. (2009). Predators of North America. Boston Mills Press. "White-nosed coati." en.wikipedia.org. Retrieved December 20, 2013. "White-nosed coati (Nasua narica)." Comparative Mammalian Brain Collections. Retrieved December 20, 2013. "White-nosed coati Nasua narica." eNature.com. Retrieved December 20, 2013. "White-nosed coati (Nasua narica)." Discovery Travel World, SA: Costa Rica Expeditions. Retrieved December 20, 2013. Wilson D.E. and D.M. Reeder. (2005). Mammal Species of the World: A Taxonomic and Geographic Reference. 3rd edition. Johns Hopkins University Press. White Nosed Coati in Costa Rica: photo by Stefan Meyer. 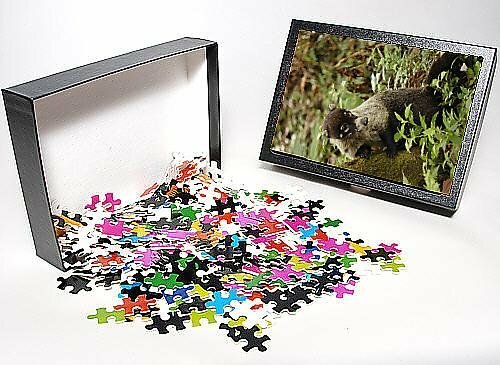 Photo Puzzle with 252 pieces. Packed in black cardboard box, 5 5/8 x 7 5/8 x 1 1/5. Puzzle image 5x7 affixed to box top. Through the words of Maria Retana and the illustrations of Salva Ferrando, enter the world of white-nosed coatis. AbbyFitz, Me, too: I'd welcome a scampering coati in my yard, as well.